Did u hear the jury questions today? It was like they were questioning him on the likelihood the travis could chase jodi down the hall after a gsw to the head. Im pretty certain that if u got hit hard enough in the head with a board u would be somewhat out of it let alone a bullet penetrating your brain. Im sure there have been people who have taken a gsw to the head & lived but i doubt they hopped up & tried to fight. Common sense people. Why do i have this feeling this verdict is not going to be what we want it to be? Even if they believe that travis abused jodi in some way how could they not see thst there is no way he was shot first & then needed to be stabbed 29 times & have his throat cut to near decapitation to no longer be a threat to her? Im afraid for the intelligence level of our "peers" if they cant figure this out. Btw does anyone else want to cut their own throat rather than look at or listen to jayne weintraub? I despise this ugly troll of a woman. According to her, noone who commits a murder is guilty. Thats why i like joey jackson. Hes a defense attorney but can concede to the obvious guilt here. ideals that they grew up. So I think they will use their own life experience to judge the way Travis and Jodi treated each other. if she ever gets out of prison. I can atest from personal experience a gun shot to an individual would kill the person or make them pretty helpfess. shot Travis in the head, Travis, as dr. Horn testifyed would not be able to run down the hall or after her. right opportunity. That also explains why she was in such a hurry to get out of there and missed crucial evidence - the camera. Another room mate was due home by 6 pm. I have a feeling that Travis wants justice and everything that Jodi has tried has failed. Let's hope that Justice prevails. She is a white female in her 60s and sits closest to the witness stand. She doesn't look at Arias often during her testimony. People in the gallery observed her yawning once during an emotional part of Arias' testimony. He is a white male in his 50s. He takes few notes and usually has his head cupped in his hands as he listens to testimony. She is a white female in her 40s. She takes a lot of notes and often watches prosecutor Juan Martinez as he moves around the courtroom. She has been seen submitting questions. He is a white male in his 60s, and he takes few notes. She is a white female in her 60s and is also seen taking many notes. He is a white male in his 30s, and he is married. He takes notes and often bites his nails. Juror No. 8 - dismissed. He is a white male in his 60s. He wears denim on most days and sits at the end of the jury box. He sits close to the first row of the gallery where Alexander's family sits. He is a white male in his 70s and is married. He has a tattoo on his right arm. He rarely is seen taking notes. He sits the furthest away from the witness. She is a married, white female in her 30s. She takes a lot of notes. She does not look at Arias during testimony. She tends to look straight ahead or down at her notes. She is a white female in her 40s and also takes lots of notes. She swiveled her chair toward Arias during her testimony. He is a white male in his late 60s to early 70s. He wears an audio-enhancing headset provided by the court. He does takes notes. He is a white male in his early 60s who often swivels in his chair. He does not appear to be taking notes. He is a white male in his late 20s or early 30s. He appears to be the youngest member of the jury and takes very few notes. He smiled when Martinez asked Arias if she could predict the future. He is a white male in his 40s. He is a Hispanic male in his late 20s to early 30s. He dresses casually and sometimes slouches so far down in his chair that he is hardly visible to the gallery. He does not appear to be taking notes. She is a white female in her 40s. She is an occasional note taker and she often looks at the gallery during sidebars. I can't stand her either. she needs to shut her pie-hole. liar". She seems like a sweet girl. Do you have a link back to where you found the list of jurors, Kermit? It sure would be handy to have it as a reference. Thanks! Here's a list of the jurors. It is not updated to show #8 has been dismissed though. Dose anyone now why #8 has been dismissed . Dang I missed court today. Had errands I had to do. So next Wednesday the defense gets to call in another excerpt to rebuttal the prosecution excerpt. Then it goes to the jurors. You can catch it all on youtube, GE. Ever since the Casey Anthony trial, I don't trust anything, but Jodi Arias is SO guilty! She reminds me of KC.......... both think they are smarter than everyone else and both are such wordy liars. I don't know how any juror could hold out on a guilty verdict, but you just never know. I hate that the defense gets to bring yet another mumbo jumbo "expert" on to explain how poor Jodi is misunderstood..... geezz. I am right there with you CBB. She is so much like KC. Until the verdict comes in guilty I wont hold my breathe. And why the defense got to call in another mumbo jumbo lie though your teeth "expert" is BS. Can not stand Janie W...she is awful and sounds delusional when talks..
Did the girl who Travis was engaged to previously testify in court and then did it come out about Jodi stealing the ring? I missed a lot yesterday. I saw her on Nancy Grace. She seemed lovely. I don't know Cookie. There seems to be a lot of stuff wasn't used or it was in the beginning of the trial and I missed it. PHOENIX - A local Valley police department confirms to ABC15 that a man arrested over the weekend on a DUI charge was also claiming to be a juror in the Jodi Arias trial . The arrest happened on Saturday and it was at that time the suspect told the officer he was a member of the jury. On Tuesday, the arresting officer was called into a “sealed proceeding” with the judge, the prosecutor and the defense attorneys, the police spokesperson said. What was discussed in the secret meeting is confidential. Two days later, juror #8 was dismissed and the judge gave no reason. Since the topics discussed during the officer’s testimony are sealed, police said there is no way they can confirm that the man arrested for DUI is indeed juror #8. On Thursday night, ABC15 attempted to reach the man who was arrested, but was unsuccessful. Could it be that the long drawn-out testimonies of the defence witness may have distracted the jurors focus on the facts encompassing the prosecution's charge of PREMEDITATION. Prosecutor Juan Martinez rocked Jodi Arias during Wednesday afternoon cross-examination by playing a snippet of a phone conversation where she told a detective that Travis Alexander did not have a gun — a direct contradiction to her earlier testimony. It appeared to be one of the biggest scores for Martinez, who carefully led Arias into her conversation with Detective Flores in the days after Alexander was killed. “Do you know of him having any weapons,” the detective asked Arias. “Handguns?” And Arias calmly said, “No. He was more into like wrestling.” She earlier testified that Alexander chased her in a rage, causing her to shoot him with his own handgun. 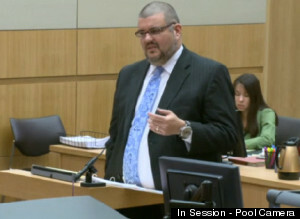 MARTINEZ: She was asking you for gas cans in May of 2008 at the very end so that she could make a trip to Mesa, Arizona? Do you remember that? MARTINEZ: And she made more than one call asking you for these gas cans to make a trip to Mesa, Arizona, didn`t she? WHAT IS VERY TELLING THOUGH IS LISTEN TO JODI TELLING DET FLORES ....LIARS ALWAYS MIX THE LIE WITH THE TRUTH. Jodi tells Det. Flores: "Travis was screaming the whole time..............like he was in pain, shocked"
Jodi: "He was still alive, conscious even"
sorry about all the spelling errors, I don't see that well. Page created in 10.185 seconds with 19 queries.